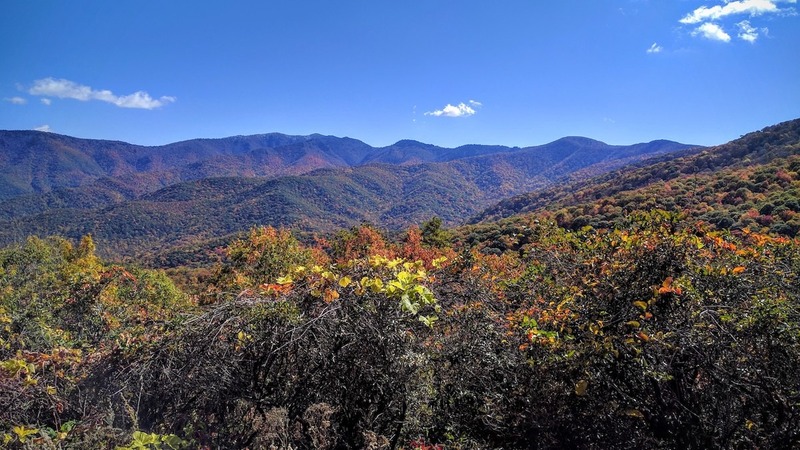 It’s October, which means it’s time for my annual trip to the Smoky Mountains to check out the changing leaves and hike in the mountains. No couple’s trip this year for me, it was a guy’s camping trip. 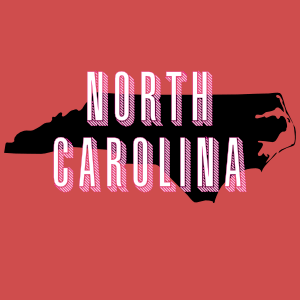 We would be staying at Smokemont campgrounds inside the park on the Cherokee, NC side. We threw our supplies in the truck and headed north to the mountains! An hour from Asheville on I-26 we came to a complete stop and put the truck in park. 3 miles from the nearest exit traffic had stopped us in our tracks. I didn’t care what the next exit was, I was taking it. Our Waze ETA went from 2+ hours sitting in the traffic to a little over an hour winding through back roads. This was top 10 greatest driving decisions of my life. With our sanity intact we stopped for NC BBQ in the closest highly Yelp rated restaurant we could find, 12 Bones Smokehouse. While the side dishes left a little to be desired, the ribs were on point. I’m not sure I would recommend this place though because I feel you could get better overall BBQ somewhere else. Entering the Great Smoky Mountain National Park we saw a large sign warning us to be cautious of elk crossing. We figured we wouldn’t be lucky enough to see elk. We were wrong. Less than 100 feet ahead a large clearing opened up to our right and there in the field were two large elks, a male and a female. You could tell they were massive even from how far away we were. With a sun setting in the background, it made for a picturesque sight. Great, be on the lookout for The Courier! You know how you always forget something on a trip? Yaaaaa…what we forgot is actually a pretty big deal. We pulled up to our campsite and began to set up camp, the temperature had dropped considerably and the rain had rolled in. Just as the last person threw his rainfly over his tent, the rain subsided. Camp set up? Check. Fire going? Check. Chairs to sit on to escape the cold, wet ground? …Those were sitting at home. While two friends started dinner, the third friend and I headed to Cherokee hoping to find a place still selling camping chairs. We stopped at a gas station to ask if the attendant knew a place we could buy a camping chair nearby. The woman laughed at us. Undeterred, we checked tourist shops, pawn shops, and gas stations. Everywhere was either closed or laughed at us. We had all but given up hope when we stopped at one last gas station. There were no camping chairs here either. However, there were pool floaties. Not ideal but at least our butts would stay dry. The clerk looked at us like we were crazy for buying floaties while wearing sweaters. Oh well, we were going to be dry and that’s all that matters. Blowing up the floaties ended up taking way more effort than we felt it should so we just laid them out like tarps over the picnic tables. That night, we drank whiskey, ate s’mores, and shared stories which are the best parts of car camping. Our first stop? 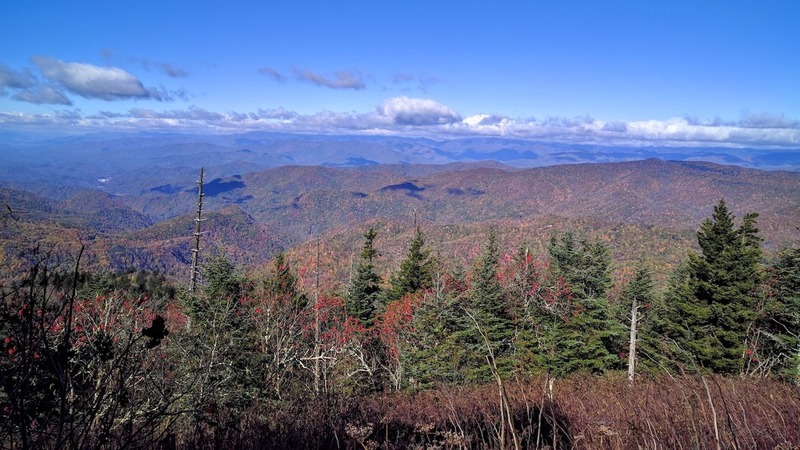 Waterrock Knob. A place I’ve been to almost half a dozen times and yet never get tired of. I can picture every twist and turn along the route and could almost do the hike without looking at this point. I did experience one thing I had never experience before though. As we hiked up the path, a bald eagle soared over our heads… ‘Merica! I could stare spellbound at the mountains from this peak for hours, studying every little intricacy of the range. Before making our way down, we started talking with a man on top of the peak. He and his toddler were camping for the dad’s birthday. Apparently, they have a tradition that on the dad or the son’s birthday they go camping in the mountains, always choosing a new mountain to camp on. I’ll be adopting this tradition when I have children. After a brief pit stop at the Waynesville Walmart to buy camp chairs we were back on the Blue Ridge. Stopping at vistas along the parkway we hiked a few unnamed trails before making our way to Mt. Pisgah. I’ve never hiked this trail before, we were supposed to on our honeymoon but snow closed the roads up to it. As you drive past the Mt. Pisgah Inn there will be a lot on the left side that is for a picnic area. This is the parking area you want. Go toward the end of the parking area, past the trails to the picnic benches and you’ll see a small opening for a trail that should immediately descend, that’s how you know you’re on the right trail. There is a parking lot you can go to that’s just past the picnic area parking that will take you right to the mouth of a flat trail to start the hike to the top of Mt. Pisgah. Pro tip: Take the trail near the picnic area. It does add about a mile round trip to your total but it’s an awesome trail. Narrow and possibly a little overgrown at times it is one of my favorite parts of the Mt. Pisgah trail. Trekking through yellows, reds, and oranges all around us we climbed higher and higher. It is not a trail to be taken lightly and was the most strenuous hike we did this weekend. The view from the top though, 100% worthwhile. 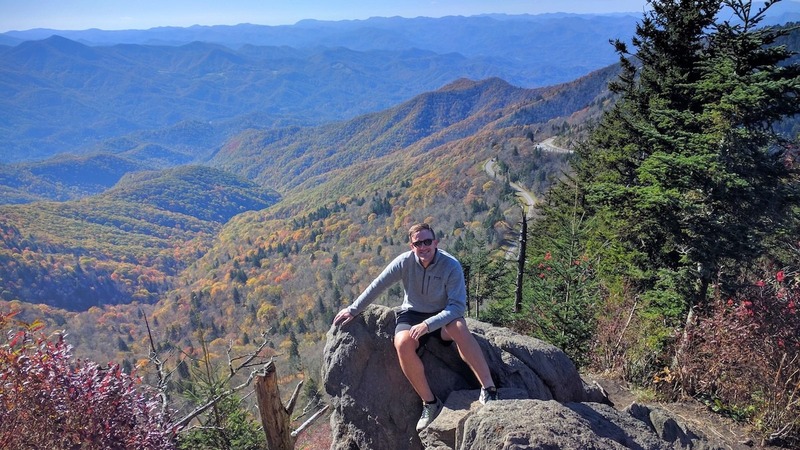 Near 360° panoramic views of the Blue Ridge Mountains. The temperature the second night we camped was colder than the first. I use a Kelty mummy bag and thankfully I was nice and warm in that. However, my face was obviously sticking out of the bag. My face got so cold, it woke me up. I thought it was a struggle to get up and pee in the middle of a normal camping night, that was nothing compared to how much willpower it took to unzip my bag to pee when it was this cold out. I slinked back into my sleeping bag and pulled the one piece of clothing I wasn’t wearing over my face and went back to sleep. The next morning, we looked up the previous night’s temperature, it had been 25° F. That was the coldest temperature I’ve ever camped in. Let us evaluate your current marketing and website, so we can provide you with recommendations to generate more revenue.  The Campfire Courier is our Newsletter. In this monthly email, you'll receive our latest Campfire Stories and content offers!